Pelicans are the largest birds in Order Pelecaniformes, the white Dalmation Pelican (P. crispus) being the largest pelican. The Brown Pelican is the smallest. All pelecaniforms have webbed feet, with the peculiar addition of a forward-rotated hind toe adding extra web to the inside. All four toes are webbed together. The distinctive feature of pelicans is the pouched bill used in feeding. There is no sexual dimorphism. Brown Pelicans nest along the southern California coast south to the coast of Peru, and on the Galapagos. They also use the Atlantic and Gulf coasts, from North Carolina through the West Indies to Venezuela and the mouth of the Amazon. Non-breeding birds may range from Canada to Tierra del Fuego. Currently, distribution is spotty over the old range. Brown Pelicans prefer shallower inshore waters, estuaries and bays, and are seldom seen on fresh water. Zoo – Fish (with salt pellets and vitamins added). 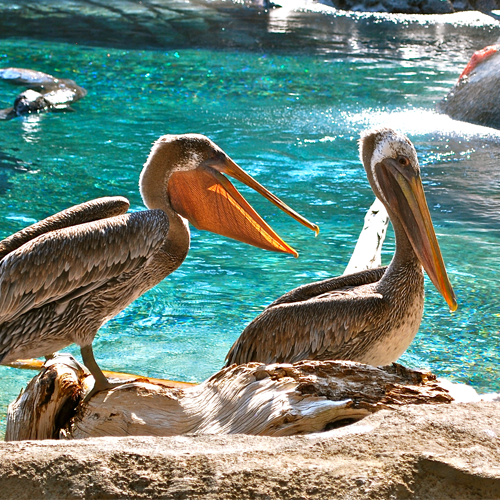 Brown Pelicans are brown with a lighter colored head and throat (the head may be straw yellow). The bill and feet are dark and the bill pouch is usually gray and bare of feathers. Juveniles have darker heads and lighter bodies. Males, in breeding season, tend to have a brighter yellow on the head. Eastern birds sometimes have a reddish bill. The Brown Pelican is the only pelican that uses the plunge-dive while fishing. The bird flies some 20 or 30 feet above the water. On sighting a fish, it plunges down steeply, piercing the water with head out-stretched and wings extended back. The bill-pouch takes tremendous forces, as the pouch distends, taking in water and fish. Any fisherman who has tried to dip-net a fish knows the problem. The bird cannot draw the water-filled bill-pouch through the water. The open bill becomes a pot and lid. With the arms of the lower bowed into a circle, the upper over-rides the lower, startling the fish into a reverse (hopefully into the net of the bill-pouch). The fine muscle fibers of the bill-pouch begin squeezing the water out as the bowed arms straighten and the bill closes. The bird begins floating toward the surface as the bill-pouch empties, trapping the fish inside. When the bird pops to the surface, the water is nearly out of the bill-pouch, the last being pushed out the slots between the upper and lower parts of the bill. The fish is then turned, if needs be, and the fish is swallowed whole, head-first. Speaking of fishermen, pelicans will often follow fishing boats, looking for a free meal – the same thing goes for robbing other sea birds. Gulls often rob the pelicans. In flight, the head is carried over the shoulders, with the neck in a vertical s-curve. The bill and pouch-skin are relatively heavy and that position gets the weight more over the center of gravity. Brown Pelicans fly just above the water’s surface, in long lines, each in the slip-stream of the wing tip in front. They flap and glide in rhythm and the flap sequence often moves down the pelican line fan-dancer fashion. When flying distances, the pelican line will usually follow the line of cresting waves that form along the coast. There is a rolling thermal created by on-shore/off-shore winds that uplifts at the wave crest. The birds can often be seen soaring effortlessly only 2 feet off the water. The bill-pouch is elastic skin attached along the branches of the lower mandible and down the front of the throat, additionally supported and controlled by a greatly enlarged hyoid bone. The branches of the mandible are very flexible and the skin is very distensible. A large volume of water (well over a gallon) can be taken in with the mouth-full of fish. The bird surfaces and the upper mandible, serving only as a lid to the pouch, is clamped shut. The head is tipped and water is drained out along the margins of the lower mandible. The fish are kept in, much like ice in a slot-lidded pitcher. The fish are then swallowed whole. If the fish require turning to facilitate swallowing head-first, the bill has a small hook, called the nail, on the tip to hold the slippery fish while it is turned. The large paddle-like webbed feet are used to give the bird the final thrust in its under-water fish-grab. The folded wings can be used in a rowing motion. The pelican is very light weight for its size and is cork-buoyant, popping to the surface even as its bill-pouch empties of water. Pelicans nest in large, sometimes mixed-species colonies. The nest may be reeds and branches, or simply a few feathers. They most frequently nest on islands and usually on the ground. They do occasionally put a large stick nest in a low tree or large shrub. Pelicans often sit on an empty nest, so incubation is not easy to figure out. In captivity, it is about 30 days. 2 to 3 eggs are usually laid but pelicans are very sensitive to disturbance, early on, and often abandon nests. One chick a season is usually all that is raised. Pelicans do not have a brood patch and, instead, incubate their eggs under the webbing of their feet. This is a major reason why there was such a problem with egg-shell thinning due to DDT. They stand on their eggs instead of straddling them as most birds do. The chicks are naked and altricial, becoming downy in one to two weeks. Month-old chicks can branch to escape a threat, clambering along in a somewhat ungainly manner. [The term “branching” is primarily used with owls. Owlets regularly leave the nest while still quite downy and nowhere near ready to fledge. They clamber about the branches of the nest-tree, calling to returning parents for their food.] The pelican nesting period is long, and fledging is at 12 to 15 weeks. The fledglings are independent at 18 weeks. Maturity is not reached till after the third year. Apparently some pelicans do not breed every year. Portions of mature populations have been found with the juveniles some distance from the breeding grounds. They can live over 30 years. Habitat Primarily found along coasts and in bays and estuaries. Brown Pelicans were listed as endangered, primarily due to DDT contamination, in 1970. They are back from near extinction and are currently listed, by the IUCN, as Least Concern. Pelicans are threatened by pollution and have been known to go blind because of chemical spills along the coast. They are also susceptible to avian botulism. Pelicans (especially off of the coast of Peru) are considered one of the most important guano birds. The Brown Pelican is the state bird of Louisiana. Pelicans will splash the surface of the water with their wings to force the fish toward the shallow water where they will scoop it easily with their bills.